Season 9 of The Real Housewives of Atlanta is in full swing, and the show would not be what it is without its typical storylines. From fights over who has the most expensive and well-decorated homes to who’s sleeping with whom or who’s stepping out on whom, The Real Housewives of Atlanta continues to provide enough shade for everyone to enjoy his or her favorite weekly cup of tea. Unlike past seasons, season 9 has introduced us to storylines that involve several of the cast members’ children. 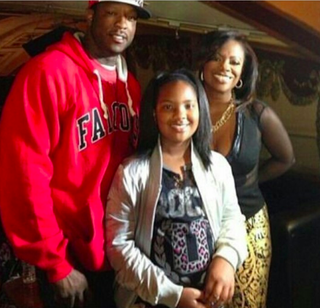 In last week’s episode, Kandi Burruss opened up about her daughter Riley and Riley's estranged relationship with her father, Russell “Block” Spencer. Evident in this week’s episode, emotions are still running high for Kandi as she voices her frustration with Block over his lack of drive to create a meaningful relationship with his daughter. Since said storyline has been introduced, I’ve wondered: Why can't it be a good thing that a father doesn’t want to be in the life of a child? Now, before you stop reading, hear me out. I remember my mother telling me when I was about 5 years old that she and my father were separating. At that age, I didn’t fully understand what divorce meant, but I knew that it made me sad to see my mother crying all the time. It wasn’t until the age of 7 that I fully understood what divorce meant. Anytime I asked when I would see my father, my mother would tell me that he was unavailable, and that possibly one day I would fully understand. When I turned 10 years of age, my father began to make attempts to reconnect with my brother and me. My father often broke his promises, leaving my mother to pick up the pieces of our broken hearts. As I got older, I began to learn that these issues were never any fault of mine or my mother’s, but that my father was never capable of maintaining a quality relationship with my siblings and me because he was never taught to. Over time, I began to realize that society doesn’t place the same weight on men to hold relationships that it does on women, and that was part of the reason my father had a difficult time being present. Often, men are not expected or required to be as emotionally available to children as women are, and this can be damaging in situations where co-parenting is necessary. Now, at 31 years of age, I say with a full heart that I am grateful for two things: 1) that my mother never forced me to have a relationship with my father, and 2) that my father opted to stay out of my life. While this can be a tough statement to swallow, the reality is that a forced relationship with any parent does more harm than good. Fully coming to terms with this taught me the importance of having relationships with individuals who truly want to be in my life, and I am so thankful that my mother gave me the space and time to come to terms with this on my own. I also learned that if my father had been around, he might have caused me more emotional problems than I already have as a man from a single-parent home. That said, this article is not meant to bash black fathers or black parents. The reality is that for any parent, having children means learning to become less selfish while developing the emotional capacity to become more selfless. In these moments, when a father actively chooses to run away from his relationship with a child, we have to teach our children that this is not a reflection of who they are but a reflection of their parent’s values, experiences and capacity to parent. The reality is, some men are not good fathers and might cause more pain in the life of a child by being present than by staying away. The best thing my father could have done was to stay away to work out whatever issues he had. My point: Sometimes a relationship can be more hurtful than helpful. Allow your child to have the space to make the decision about his or her relationship with a parent after a breakup. Be honest with your child. Chances are, children in this situation know more than what we want to give them credit for. Yes, Kandi has every right to be upset as a mother who loves her child and cares for her well-being. At a second glance, though, reflecting on this storyline can teach us that sometimes a square relationship doesn’t necessarily need to be in your circle to make your child whole, and that distance can truly make the heart grow fonder. Recent from Jonathan P. Higgins, Ed.D.